The general rule when it comes to tree services in Sydney is: if you can’t do the job with your feet on the ground, it’s time to contact an arborist. Working at heights requires training and specialist equipment to avoid accidents. That’s why for your own safety it’s better to consider hiring a professional. At Bradshaw Tree Services, we understand that choosing the right tree services company can be a risky and time-consuming process. So in today’s article, we decided to list the most important questions you should ask arborists before you hire them as not everyone will always be suitable for required tasks. Do you have all the relevant qualifications? 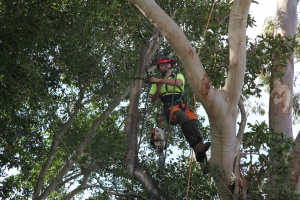 For any tree services in Sydney, we recommend the companies who are members of the International Society of Arboriculture and Arboriculture Australia. Do you have relevant and up to date insurance? You don’t want to become responsible for any accidents which may occur on your property. Many companies list testimonials on their websites. You also can check directories or Google My Business for reviews about the quality of their services. Can you give a details quote? Like for most of the services, it’s better to get a detailed quote first and compare it with other companies to avoid misunderstandings and hidden fees. Here it’s also good to compare different quotes. Is your crew protected with safety wear? Ask about hard hats, ear muffs, chainsaw proof pants, etc. Any reputable company should be mindful of the safety of their employees. Also, ensure that they follow OH&S procedures. What practices do you recommend? It’s good to make sure your arborist uses all the latest and safest techniques. At Bradshaw Tree Services, we are passionate about our business and believe any good arborist should love providing great tree service as much as we do. Contact us now to organise a free quote.